For Caps fans suffering from heart conditions, high blood pressure, or Post Traumatic Shootout Disorder, be advised the remaining games this season will be intense. The Capitals have gone to the shootout the second fewest times in the league this season, but they ended up in shootouts twice just in the last week with everything on the line. The past two games have had the same script – go up by two, lose the lead, then go to a shootout and win. 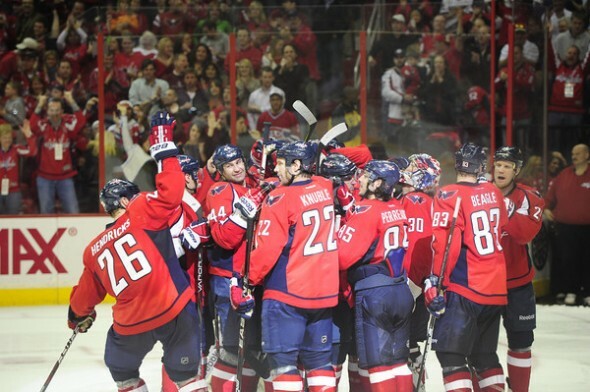 It’s a game plan that isn’t drawn up by Coach Dale Hunter, nor one that is easy on the hearts of the Caps’ faithful fans, but with extra shootout points this week they now have a playoff spot within their grasp. The NHL adopted the new shootout tie breaker at the start of the 2005-2006 season. Since then, like any major change, it’s gathered a fair amount of criticism. The biggest knock against the shootout is that it’s against the nature of team sport to have a game decided by a contest of individuals. “I think it’s akin to an NFL game being decided by the quarterbacks throwing footballs through a tire,” says Toronto Maple Leafs GM Brian Burke. For the Caps though, the argument that the shootout only puts on display the top three star players isn’t true. When only three selected shooters plus goalies have the game on their shoulders with another 30-odd skaters left to watch, the Caps have been banking on a fourth-liner who averages only 12 minutes of ice time. In Washington on any given night they have Ovechkin, Backstrom and Semin on call for the shootout, but it’s Matt Hendricks who’s getting it done. Hendricks is a 30-year-old left winger in just his third full NHL season. While his stats are underwhelming with just nine points and a minus-6 on the season, when it comes to shootouts he’s a game changer. This season he’s scored on five of his six shootout opportunities, tying him with Daniel Alfredsson for the league’s best shootout percentage. Dale Hunter went to Hendricks to kick off the shootouts in both games against the Bruins and Habs this week and, to his credit, he netted them both. On each occasion Hendricks has taken to the shootout he has a go-to move that he’s stuck with for every shootout opportunity this season, which he’s humbly dubbed The Paralyzer. The Paralyzer is a pump fake move that seems to freeze goalies in that time Hendricks is able to easily pick a location in the net. “I learned it a long time ago back in high school from an old NHLer by the name of Scott Bjugstad,” Hendricks said. “I don’t know. It’s the only [shootout move] I got going for me.” “I don’t like to talk about it too often,” a humble Hendricks said. As for Washington’s playoff chances, they’re playing division rival Tampa Bay tonight and in a season series in which the Caps have needed extra time to decide a winner three of five meetings, the Caps may need another heroic effort from the unlikely hero Matt “The Paralyzer” Hendricks. In the first meeting between the Lightning and Caps, Hendricks again put the Caps up one point in the standings with a shootout goal. Hendricks may only have nine points on the season, but his impact in the shootout has helped them to four extra points in a season where every point means so much.